When someone arrives at your website they might know very little about you. Face to face they could ask you all kinds of questions to discover if your service can solve their problem. Writing good website content will provide the answers to all of your customer’s questions in a concise and easy to read way. Would you like a more in-depth guide guide to writing your content? Take a look at Gill Andrews Content Checklist for Small Business Websites. 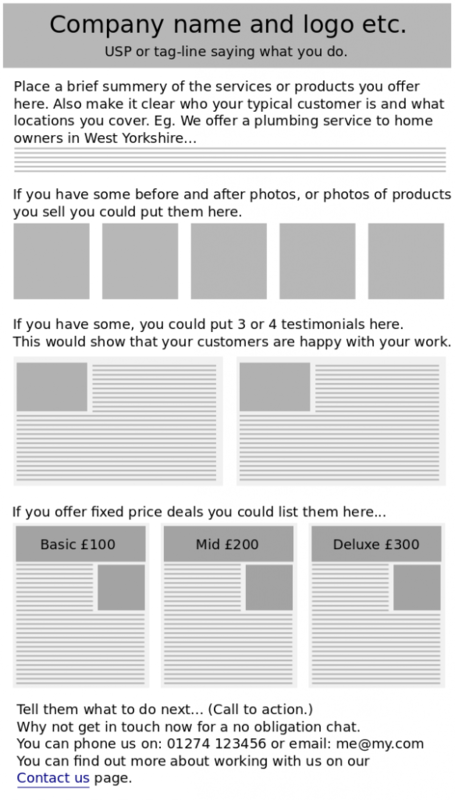 The image below shows a home page layout that provides some useful information for your customers. This is just a start, you could add much more information to your website but I hope it helps you get the main idea. Always remember that your main aim is to encourage customers to make the initial contact with you. You need convince them that you’ll solve their problem easily, with the minimum of fuss and at a price they can afford. You need to think about the type of questions your customers need answering before they’re ready to commit to working with you. You could put most of this on one page of your website, or write a whole page about each individual topic if you need to. Why not get a piece of paper and start jotting down the answers to some of these questions now? If you specialise in one particular area, make sure you put that information in a very prominent place on your website. Make sure customers can see why your service is a good match for their need. Make it clear exactly who you help. If it’s not obvious that they’re on a web page that can help them they’ll probably click the back button and try another site. “This is what happens when you contact me. First we’ll chat about what you need and see if I can help…” People are afraid of contacting a professional. Let them know exactly what will happen after they phone you. State clearly and exactly what you can do for the customer. You’re hoping that when your ideal customer reaches your web page they will immediately think “Aha! 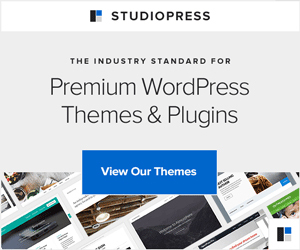 This is exactly what I need.” That’s the whole point of writing good website content. Can you show your website visitors evidence of work you’ve done in the past? You’re hoping they will think “I want the results that these other people have got”. If you can get real people to vouch for you by providing a testimonial that’s even better. The higher status of the person giving the testimonial, the better. Provide a bit of background information about you, what you do and why you are the best placed business to solve their problem. Try to come across as, a competent and easy to work with adviser who will get the job done with a minimum of fuss. Make sure website visitors can easily see how to contact you. If your customers visit your premiss, add a Google map to your contact us page. Make sure they can easily find your phone numbers, email address, location and post code, etc. If you perform a service such as painting and decorating, collect before and after photos to put on your site. If you sell products, take good quality photos of the products you sell. If you offer a service such as mentoring, show some photos of the actual people who do the work and make them look like they would be pleasant to work with. Understand how your website visitors are thinking when they arrive at your site. They’re in a hurry so be concise, don’t waffle. They don’t intend to think too hard when figuring out what you’re talking about so get to the point fast. They want your information to be easy to find, so use headlines and sub headlines that explain exactly what each section of the page is about. There should be no confusion. Customers don’t want to be overwhelmed so don’t put more than one big idea in any single paragraph. Parcel your words into easy to understand bite size chunks. Your site visitors want to get the information they need from your site as quickly and easily as possible. Do everything you can to make that happen and you’ll be ahead of the crowd. If you start collecting this information now, you’ll have a head start in writing good website content. You’ll also have a good base to build your site upon. Next, have a look at some web designs and see if you can find one you like.